I have my new Grizzly set up and overall I’ve been pleased with its features and performance. I started out a bit bad because in the box were four right legs instead of two lefts, and two rights. Grizzly sent out the left legs right away, so no big deal. 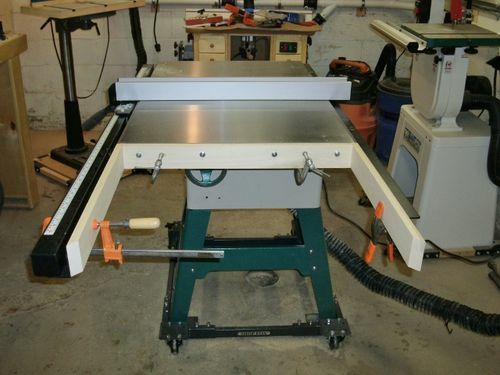 The first project using the saw was the extension table to the right of the blade. Not a lot of cutting, but gave me a feel for it’s operation. 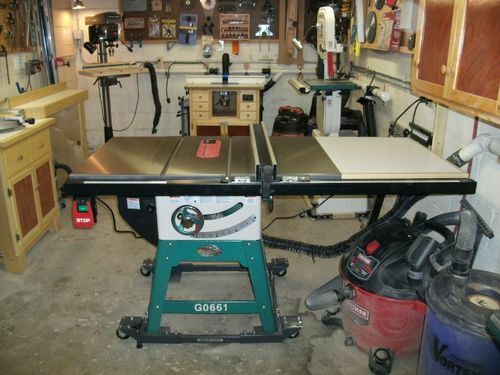 My old table saw was a Craftsman 10” that I bought new 20 years ago. I sold her on Craigslist. It was showing signs of its age. Top issues that bothered me the most were arbor runnout and a rip fence that was hard to keep aligned. The new Grizzly is a beast in comparison of size, weight, performance, and capacity. I carefully researched saws for a long time. Asked those here on LJ’s of their opinions. Most advice was to get a cabinet saw. My shop is in the basement of my house. Leading to the basement is a steep and narrow set of stairs. Getting a cabinet saw downstairs would have been impossible. 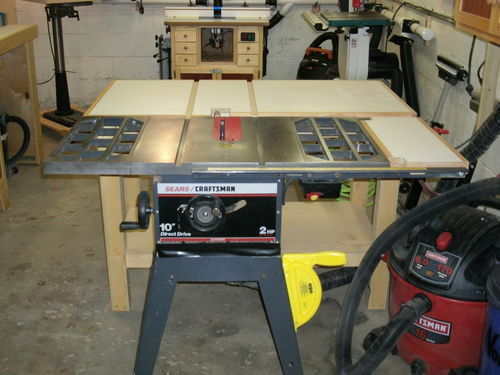 If my shop were on ground level or a garage then I would have bought a cabinet saw instead. Here’s a photo of how I prepared getting the saw down those stairs. 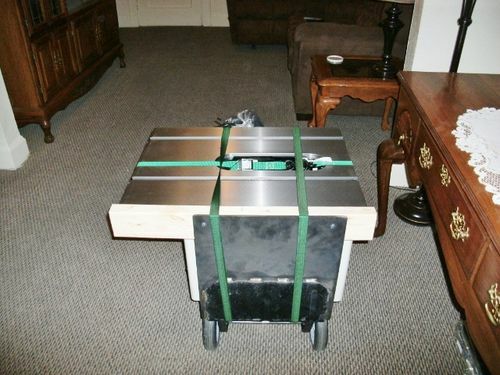 I customized a dolly and it sat in my dining room until I got help getting it downstairs. Features I like about this saw is the cast iron extensions, the ease of the column and worm gear for height adjustment, 2hp motor that can be 220v or 110v, dust collection shroud, solid one piece rail for the fence, “T” style fence with aluminum facing, cast iron w/chrome plating handwheels, riving knife, and the supplied ZCI and dado inserts. I tried to remember them all, but I’m sure there’s more I haven’t mentioned. Assembly was pretty straight forward. Instructions were clear and concise. Everything fit as it should and is solid. Minor things were adding tape to the bottom side of the tabletop edge to raise the end of the extensions to make them level. The blade needed aligned to the miter slot which gave me a bit of trouble, but once I figured it out, it wasn’t bad. The tilt axis was out of alignment. The back of the blade (tilted to 45 degree) was lower in the back than the front. I had the help of a LJ, who provided a link that helped get it aligned within a couple thousands the first try. It involved a little geometry, once I wrapped my head around the math, I was able to shim the front of the trunnion to lower it the exact amount. The ZCI insert was precut at the factory. Of course when I adjusted the saw perfectly (within a 1000th to the miter slot) the kerf in the insert was not aligned to the blade. A call to Grizzly, I explained the situation and without asking they sent me a new ZCI . The fence needed adjustment. It was easy to do. The aluminum facing is flat and true. The miter gage isn’t bad, but I am reasearching a better one to buy. Things I don’t like are the ZCI is a little loose fitting from side to side. The dado insert fits fine, and I will use it as a template to make more ZCI’s. And the fence rails weren’t predrilled on the far right for a extension, or for anyone else who owns this and wants a router table extension. So it was a bit more work drilling holes but it payed off because I have 27 X 66” of table surface now. The extension is HPL on a MDF substraight wrapped in poplar. I wanted something that would be more durable than melamine, so it was worth the trouble and extra expense of the HPL. In addition to the HPL extension, I added a Shop Fox mobile base (Model D2057A). It is a great feature to have in a small shop. In conclusion, anyone in a situation like mine where a cabinet saw doesn’t work for your shop, then I recommend looking into the G0661 or the G0713. Both are the same saw except the G0713 is a 1-3/4 horse version. Nicely set up. I don’t see where you lose much as opposed to a cabinet saw. Plus you end up having several hundred bucks to buy other shiny, sharp stuff or wood. 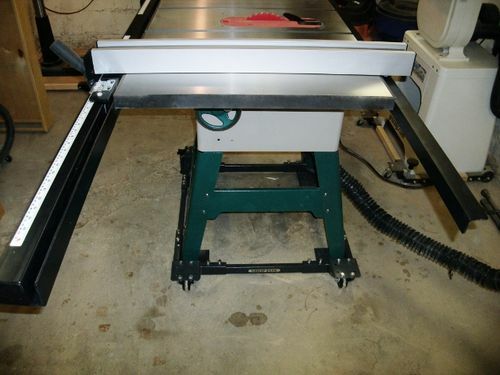 Thanks go out to Knotscott for providing all the info about whats out there in table saws. 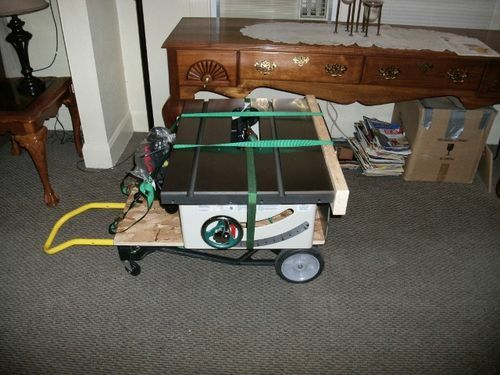 I haven’t needed a table saw in 20 years. All the info saved me a lot of time researching. Looks like you went from a “Yugo” to a Cadillac. Enjoy your saw. Nicely done, what fasteners did you use on your extension? Thanks for the review…when it comes time to upgrade this is the direction I will probably go as well. Would it be possible to get a mini blog showing the construction/underside of your HPL Extension? I’d like to see how you attached the top to the frame you built. I’ve currently got a smaller setup like that on my craftsman and it works, but it took a lot of trial and error, and I know it could still be better/more stable. 1.) I used poplar for the frame around the extension. I drilled four 1/4” holes through the cast iron extension and 5/16” holes through the poplar. I used four 1/4” x 1-1/2” hex bolts, flat washers, and lock washers to fasten the poplar against the cast iron extension. The pieces are clamped to the rails for layout. I drilled 1/4” holes through the rails and 5/16” holes through the poplar. I had to remove the square stock tube to countersink the hole for a 1/4” x 1-1/2” flat head machine screw. The rear rail I used a 1/4” x 1-1/2” hex bolt. One hole at the far end on each of the two rails. Again I used flat washers and lock washers. Measure carefully before drilling. Keep in mind the thickness of the substraight and HPL, in my case it was 13/16”. 2.) Here is the underside of the extension. 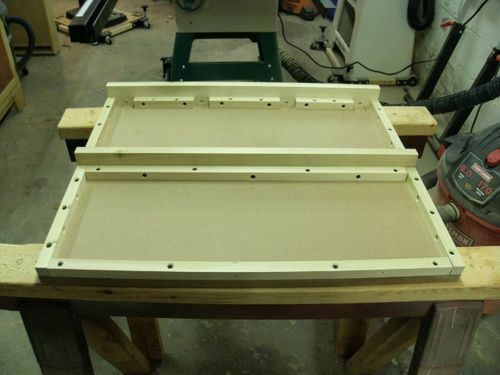 The substraight is 3/4” MDF. I removed the poplar I used against the cast iron extension and fastened to the cleats as an assembly. Note the cleats are in sections to make room for the hex bolts on that piece. I used cleats around the remaining three sides to fasten the other three poplar pieces to (later on). I used a stiffener in the middle. The stiffener is there because I wanted something in the middle of the span to fasten the two poplar side pieces (brad nailed through the face of the poplar side pieces into the end of the stiffener) and add rigidity to the top. 3.) I cut a piece of HPL about 1” bigger than the width and length of the extension. I used contact cement to adhere this. Two coats on the MDF and one coat on the HPL. Allow drying time of about 20 to 30 minuntes. The contact cement should feel tacky. Carefully apply the HPL to the MDF. I didn’t, but you could use short pieces of dowel rod to separate the two until you get it perfectly aligned. Once aligned remove the center dowel rod and work out to one side, removing the dowel rods and sticking the HPL to the MDF. 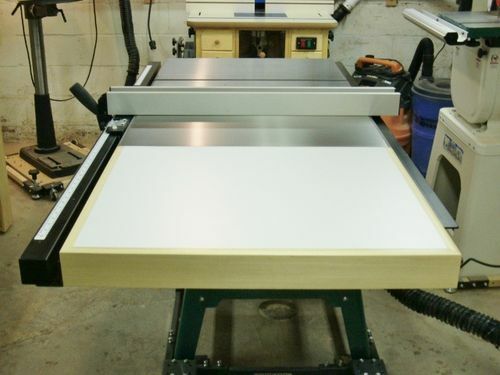 Use a laminate roller or a wood block with an eased edge to remove air bubbles and securely flatten the HPL. Repeat on the other side. Use a flush trim bit in a router to flush the edges. When done, secure the three perimeter pieces to the cleats and flush to the HPL. I mitered the ends on the two outer corners. 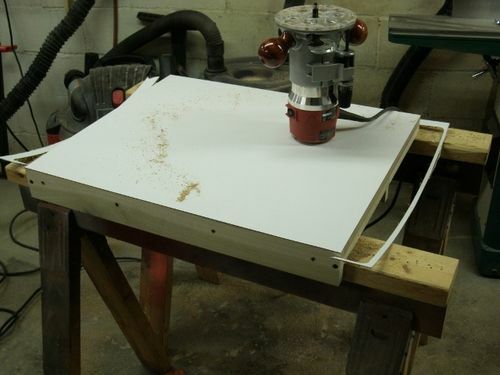 Use glue and screws and brad nails on the miters. Note the poplar has a beveled edge on these three pieces. I ripped the bevel prior to assembly. The cast iron top has a beveled edge of about 10.5 degrees. I matched the bevel on the polar to give them a smooth transition from cast iron to wood. Once those pieces were assembled I applied 3 coats of poly to the poplar. Once dry I assembled the extension simailar to the cast iron extensions. Thanks! I really appreciate your overview – looks like I will be building a replacement extension for both sides of the ol’craftsmen following this method! Hey camps764, your welcome. Good luck to you adding your extensions! Nice review, and great pics! Congrats and enjoy!